It’s already September with just around 20 games left to play in the 2018 MLB regular season. Several teams are now eliminated from the playoffs. Teams like the Toronto Blue Jays, Kansas City Royals, Texas Rangers, Cincinnati Reds, San Diego Padres, and the Baltimore Orioles. The Orioles currently sit 55.5 games back in the American League East. They have the honor of owning the worst record in Major League Baseball at 40 wins and 94 losses with a winning percentage of just .293. 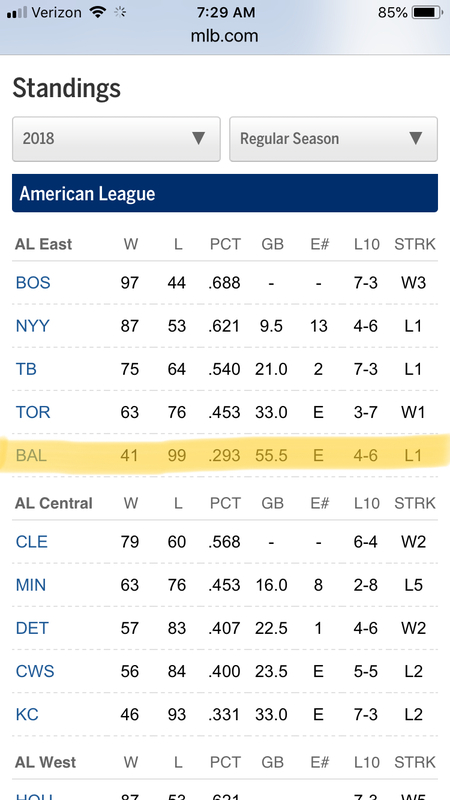 These Orioles could play the spoiler down the stretch beating teams that they shouldn’t so your team can make the playoffs. Recently a friend told me that he’s done watching baseball until the playoffs. He’s a Braves fan. His team currently leads the NL East so I just didn’t get it. September baseball is exciting. I’d argue it’s the best time to watch baseball especially when your team is in a race to win their division or get a wild card slot. There’s always a division race in which every game of the 162 game season matters. This year the NL West currently has 3 teams just 2 games apart trying to win that Division. September is the point in the season you’re really aware of who your team is. Who’s really stepping up for them? You’ve seen enough wins and losses to know what your squad is made of. You know those injuries that are affecting your bench and then there’s those last-minute trades. Trades that come completely out of nowhere. Mind blowing trades. Trade alerts that take you from half asleep on your couch to jolting awake. This happened to me and I immediately sent a text to friends to confirm that the Yankees just got Cutch. Down the stretch baseball keeps me up at night checking scores and watching the west coast games. Every morning I find myself checking the standings. How many games back is this team and how many games back is that team? Now it becomes a complicated math equation counting the games left, games back, the schedule ahead of them, etc. How many games do you have to win to clinch a spot in the playoffs? Or what’s the magic number that eliminates your team? Cellar dwellars can play an interesting part as spoilers. Their season is over but they can pick off a team leading their Division making those Division races tighter. The New York Mets who have had a disappointing season and won’t be making the playoffs just took two of three from the Los Angeles Dodgers. The Dodgers are trying to win the NL West along with the Colorado Rockies and the Arizona Diamondbacks. If you’re a Dodgers fan these are the series that drive you nuts. These are the series that your team should be winning. Now that kids are back in school and fall is in the air, October will be here before we know it. The baseball playoffs are coming. It’s September 6th and we still don’t know all the teams that will make this years playoffs. This is what’s really exciting this race to October when teams will have to finish the season strong. Will your team make it? Have We All Forgotten About aTeam in St Louis?